I have told my kids to avoid burning bridges. It’s amazing the way people turn up in our lives thirty years after we were sorely tempted to tell them what we thought of them and their stupid job the day we were told to clean out our desk. What is truly amazing is that people can change and thirty years later enemies can become friends. I am so grateful that the Lord put a guard over my mouth sometimes (although, alas, sometimes I shouted over it.) I’m so glad gentle folk did not curse me when I was so angry and hurt by some folks in the church and walked away in disappointment. (Discussions about which denomination would be the greatest in heaven were as tiresome to me as the disciples squabbles were to Jesus.) I am so thankful the gentle ones not only talked about grace; they practised it. 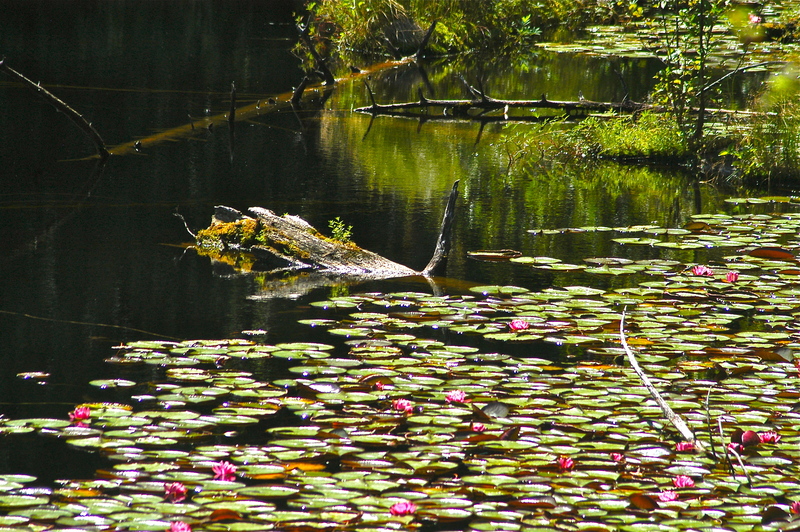 “Speaking the truth in love” is less about criticizing that part of people’s lives which is dead or rotten and more about pointing out the part of them that God sees – the part of them which, like the water lilies I saw in this pond with its dead wood, yearns to live and grow and blossom. It also struck me this week, whilst reading the apostle Paul’s qualifications to write the letter to the Galatians, that God knew who Saul was going to be even when he was violently opposed to Jesus Christ and threatened his followers. God saw something in him even then and chose him in advance for a special mission. Unlike many of us would have, given the opportunity, Christ did not curse him. When Jesus spoke the truth to him it was to tell him who he really was. Today I read another blog publicly condemning some well-known ministers. One commenter was quite willing to call them “accursed” for what he considered to be inaccurate doctrine. There is a reason why Paul told Timothy and Titus that leaders need to be able to teach, but with gentleness. It could be that God is simply not finished with the people they are charged to serve and love. It could be that people whose understanding of God is not yet complete (and whose is?) are people in process and need, like Apollos, to be taken aside and gently and lovingly taught by someone who actually has a relationship with them, rather than be publicly executed by a stranger. Decisions to remove those who have become toxic to the body from positions of influence can only be made by those who love deeply and are willing to lay down their lives for another in their care. Poor teaching is best routed by good teaching. We do not need not be contentious in order to contend for the faith. The love of God and mercy are what we all love but sometimes find difficult to extend to others. Lord, raise my love level! Love covers a multitude of sins. Thanks for a thought provoking post. As one who falls easily into the temptation to argue, Himself has provoked my thoughts as well. Yes, God is also working on my heart to fight to love not fight to be right. Jesus said this is the identifying mark: (my paraphrase) Wow. Look at how these guys actually care for and nurture each other! They are just like Jesus. What would happen if instead of criticizing a “rival church” we blessed them by fixing their roof, or loaned them some good Sunday School teachers, or even just supplied them with coffee and donuts? What if we did not listen to hearsay, or pass it on via Facebook, but actually invited them into our homes for a meal, and simply shared the gracious goodness of God with them the way He has shared it with us? What if we loved each other because while we were yet captives of sin Christ loved us enough to lay down his life for us and didn’t wait for us to have it all together? It’s strength, power and authority wrapped in love that makes gentleness the perfect antidote Jesus Christ uses to heal us from lies we tend to accept about who He is and about who we are. There are a lot of things in life that are not pretty. I chose not to look the other way. But my challenge is to not be overcome by evil, but to overcome evil with good. Its difficult at times to meet ugliness head on, and retain a perspective of gentleness. Believe me when I say that your blog is always refreshing to me, like a refuge. And helpful in lasting ways as well. Thank you so much for your kind words, CCT. I think the result of innocence lost is that one becomes reconciled to the reality of sin. Purity can be restored, but no matter the reason for the loss of innocence, whether by one’s own choice or the result of another’s choice, we lose the option of looking away. Some things can not be un-seen or un-experienced. There is perhaps nothing as disappointing as following a person who we later learn was wrong, or was hiding personal indiscretions the size of the Titanic behind a polished smile. Sometimes my family joked that dinner would be late because Mom noticed someone on the internet was wrong again. I am ashamed of those smart-mouth sarcastic replies now. They were merely an attempt to fight fire with fire and usually ended up in a conflagration that crispified anyone within reading range. One day I heard, “Hey you! Eyes here!” and I knew the Lord was telling me to look to Him and His ways. I am learning my responsibility is to turn my eyes upon Jesus, look full in his wonderful face, and see more of His goodness than the world’s evil. I guess I’m saying there is no way to not see what I have seen, but I can choose where to look next. God knows what evil lurks in the heart of men. It doesn’t take him by surprise. But when my eyes are locked on sins’s ugliness I am not beholding his beauty. His perspective is the fuller truth perspective -the only one that real matters.